Last weekend was the first really big Hobbit convention after the release of the film, and the perfect time for cosplayers to really show their quality. Ring*con normally holds a big convention in the Fall every year, but they decided to host a special HobbitCon in the Spring and invited the cast to join them, and join them they did. 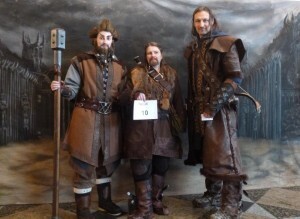 9 major cast members from The Hobbit showed up in Germany to hang with the fans, and here is a little review from the event. i hope the photos are okay for you. There are Heike = Fili, Sascha = Kili, Rebecca = Nori and Dirk = Bofur. 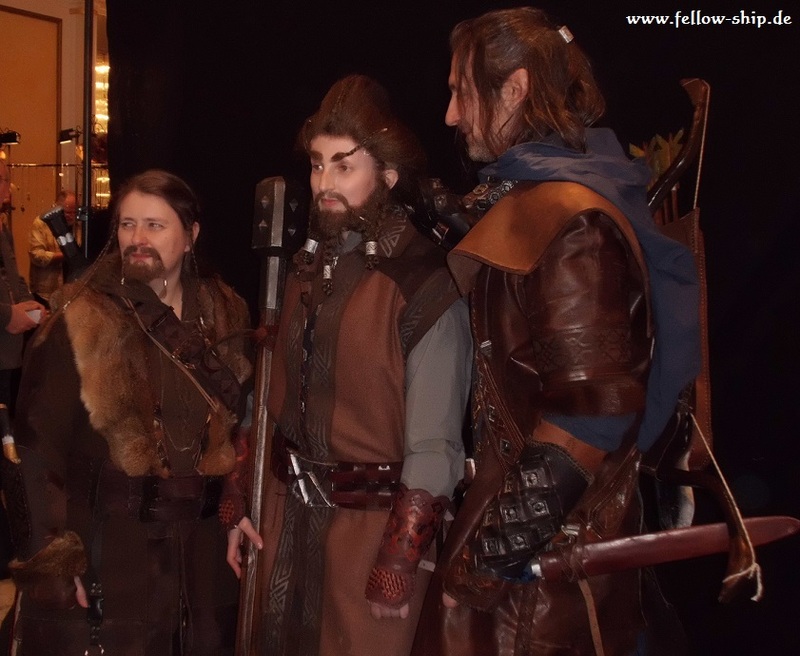 (Fili, Kili and Nori took part in the audience choice award.) We’re part of a LOTR/hobbit reenactment group and have been working on our costumes quite a long time. 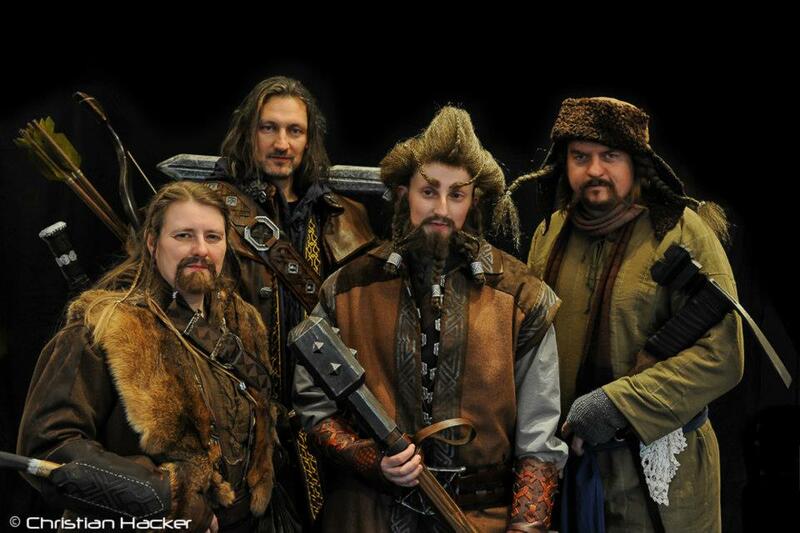 The Nori and Bofur costumes were finished just in time for HobbitCon. Well, what can I tell you? We’re visiting Ring*Con for years, but HobbitCon (special from Ring*Con) was the best convention I’ve ever seen. There were 9 actors (Jed Brophy/Nori, Dean O’Gorman/Fili, Mark Hadlow/Dori, Adam Brown/Nori, John Callen/Oin, Stephen Hunter/Bombur, Graham McTavish/Dwalin, Peter Hambleton/Gloin, Sylvester McCoy/Radagast) + Daniel Falconer and Paul Tobin from Weta… and they were all so nice and funny as well. One of the funniest moments was the Q&A session of Sylvester McCoy, who ran through the audience all time while answering questions (followed by the people, who had those questions) and doing hilarous things. [editor’s note: Sylvester did this at Gallifrey as well, he’s always been very fan friendly]. Graham McTavish brought one of his Dwalin prosthetic arms to his Q&A sessions and two fans were allowed to come on stage and put it on. And there is Jed Brophy… running, dancing, jumping all the time… doing stunts, never standing still. 🙂 One of the most touching moments was the dwarf-actors singing the song of the Misty Mountains at the end of the closing ceremonies. Entering the audience choice award was a totally new experience for us, because we never tried to before and we never expected such an amazing feedback.